Travel and the natural world have informed New Mexico-based Kevin Tolman’s work over his career from Detroit to Ireland to Kansas and LA. Last spring he spent time in Portugal in a town overlooking the sea which brought him a “whole catalog of unfamiliar sensory input.” “There are an endless number of interesting visual cues to be found there, from peeling plaster in subtle cross-light to a profusion of new color juxtapositions and patterning found in vibrant and historical layers,” Tolman said of his trip. Though, he notes, his observations are based on nature, each of his abstract pieces is a new entity that enters the world to exist on its own. Working in a variety of mediums, including acrylic, oil, pencil, caran d’ache, collage and mixed media. 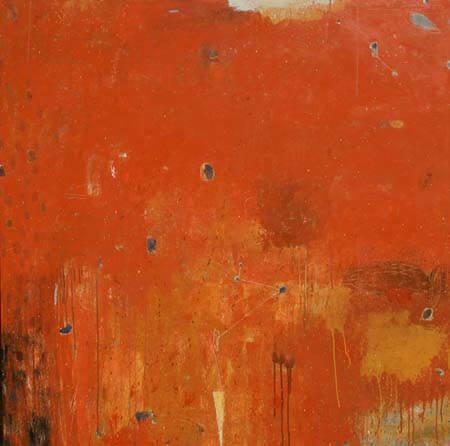 Tolman will be presenting large canvases and smaller drawings of organic abstractions in which he creates a “complex play” using symbols and mark making techniques.